These Candied Jalapeños, otherwise known as Cowboy Candy, are such a great treat any time of the year! Candied jalepeños are a great way to use up all of those jalapeños from your garden next summer! 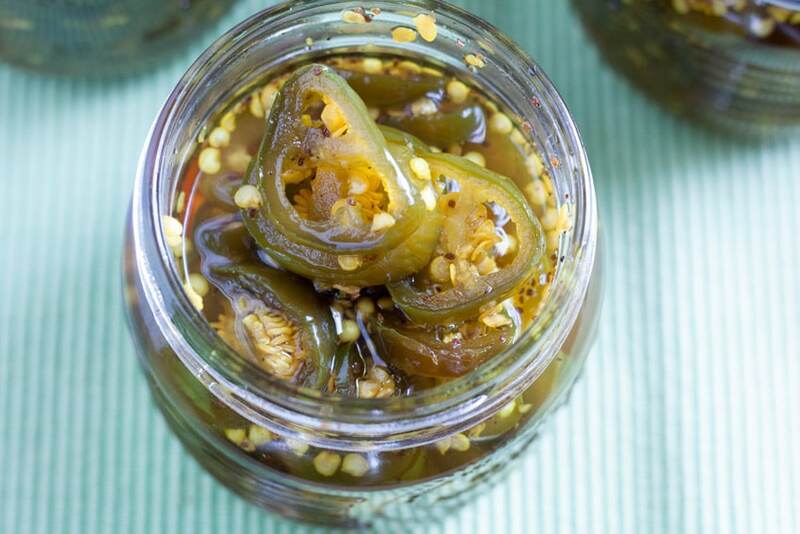 If you’ve visited BCC recently, you may have noticed that we are slightly obsessed with these Candied Jalapeños! In evidence of that fact, these Sweet & Spicy Jalapeño Pork Chops, they are sweet and spicy and so easy to make! These Jalapeño Grilled Cheese Sandwiches are a super easy lunch and really kicks up a boring old cheese sandwich to a whole new level! Peppers plants are easy to grow. Either in your home garden, or even in large pots, they are foolproof, even if you have a black thumb!. Peppers prefer hot, dry weather, and the flavor of the pepper will be hotter, the dryer the season is. Here is a helpful article regarding growing peppers. I usually plant about 30 mixed pepper plants. So by the end of September, even after picking all of the ripe ones all summer, I have about 1/2 a ton of jalapeños! Which is fine by me! I make a plethora of salsas and pickled peppers! I love having found this Candied Jalapeño recipe for a different flare! 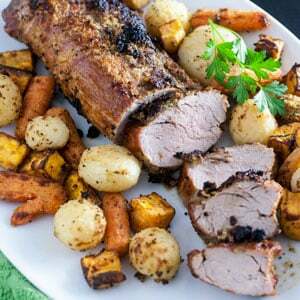 This recipe very loosely based on this but added a lot of the spices I normally put in sweet pickle relish. Mix vinegar, sugar and spices in large pot. Bring to boiling, Then reduce heat and simmer for about 5 minutes. Wear gloves to cut up this quantity of peppers!! Slice the stem off of jalapeños. Add the peppers and simmer for 4 minutes. 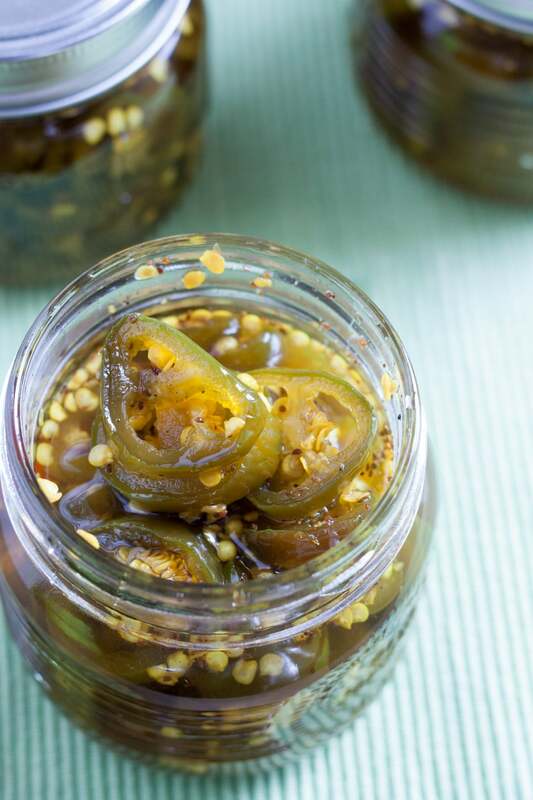 Use a slotted spoon to load jalapeños into washed and sterilized pint or half pint jars. Leave 1/4 inch head space. Once peppers are loaded into jars, turn heat up under the syrup again and boil hard for 6 more minutes. Ladle additional syrup over top of peppers in jars, leaving the head space. Place lids and bands on jars. Finger-tip tighten. DO NOT throw out the the remaining syrup! Place it in a jar and use it in a variety ways! Aioli, brush it on meat, fish and poultry try it in cole slaw and potato or macaroni salads! Anything you can think of! 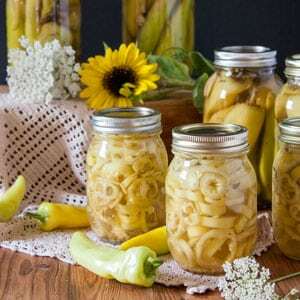 There are a few things that will make your life easier, when canning fruits and vegetables. The first is good set of canning tools. The second is a large enough canning pot. It is possible to use tools that you already have in your kitchen, but take my word for it, I have saved myself more burns , since I bought the right tools! The coolest thing about this recipe? 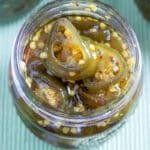 Don’t throw out the additional brine that is left after canning these Candied Jalapeños. It is amazing on these Cornish Game Hens, mixed with mayo to make a quick and tasty, spicy aioli or mixed with cream cheese or sour cream for a quick, tasty dip for veges! The possibilities are endless, really! The worse part of this recipe? You have to try to keep everyone away from them for at least 3-4 months, so that they can age! It’s torture, really, waiting for these babies to be ready to eat! In the meantime, do yourself a favor and buy a jar from your local grocer. They are readily available, but certainly not as good! I hope you like the post today for this Cowboy Candy Recipe! Do you can fresh produce in the fall? Leave me a comment below! These are the tastiest condiment you will ever eat!! Cut into 1/8 - 1/4" slices. Add the rest of ingredients to a large stock pot. Bring to a boil. Then reduce heat and simmer for about 5 minutes. 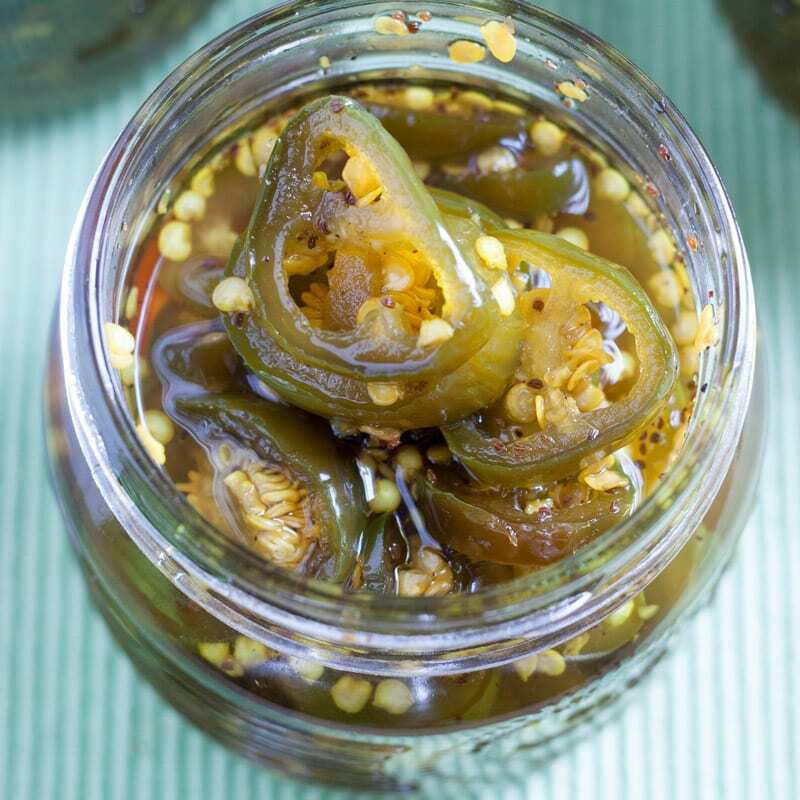 Use a slotted spoon to load jalapeños into washed and sterilized jars. Leave 1/4 inch head space. Place the jars in the canner with hot water in it. Bring to a full rolling boil. Boil for 10 minutes for half pints, 15 minutes for pints. Turn off burner and let stand in hot water for 5 more minutes. Then remove and leave stand on counter overnight. The next day check for seal. If center of lid flexes up and down, they must be stored in the refrigerator. Place sealed jars in a cool, dry place. Try to resist the temptation to open them for at least 2 months! I like waiting 3 for the flavors to develop! In the meantime, console yourself with the syrup!! Wow, this looks fantastic! First of all, your haul makes me want to plant peppers next spring/summer, and second, how incredibly fun to have access to these all through the winter. So many good ideas for using them, too! Peppers are really easy to grow and don’t take a lot of room! They just don’t do great in a very wet summer! Thanks so much for your comment, Monica! If you have a balcony in your apartment they grow very well in pots, Patty! Thank you my friend! I need to share this recipe with my Mum, she loves jalapeños and I bet that she’s gonna love this! Thanks Diana! Let me know how Mum likes them! Super interesting! I have never had or attempted to candy jalapenos. Sounds like a great way to top a salad or just to snack on. They are good on just about anything! IMHO! Thanks, Heather! I am so jealous you grow your own peppers….these candied jalapeños look so fun to eat. They are easy to grow! Even in pots they do very well! 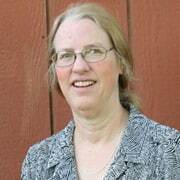 Thanks, Sandi! They are totally good to eat right out of the jar, for sure!! Thanks, Jillian!! I make these every year. Great with so many foods. I agree they are delicious with so many things. Did you try the recipe and find something wrong with it? Just wondering about the 4 star review. Thanks so much for the comment! I don’t have any granulated garlic, can I replace it with milk need garlic. I have everything except that. I am so Anxious to make this candy! Do have any garlic cloves, you can certainly substitute that! Or even garlic salt. I’m not sure about your question. You can not add milk, for sure! If you don’t have any of the garlic, it will NOT ruin the flavor. Just omit it. 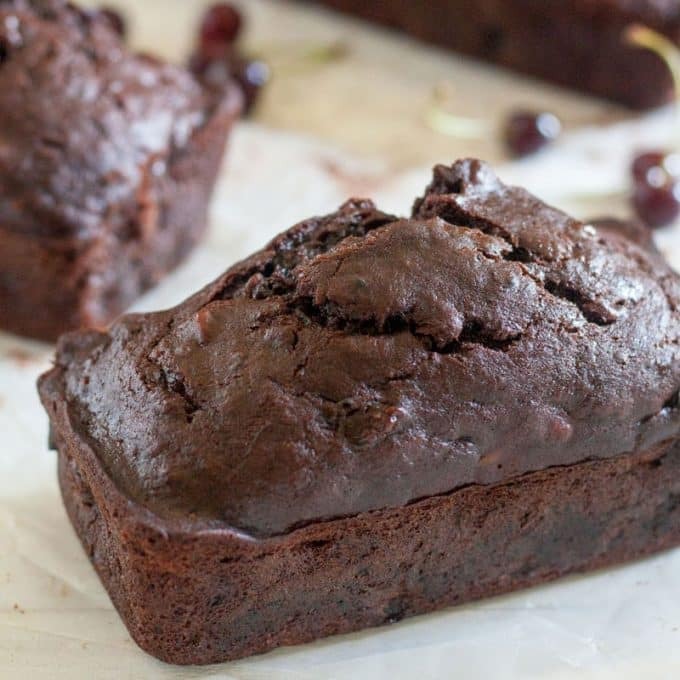 I attempted this recipe after an aunt gifted me a couple of delicious jars. I unfortunately don’t feel as though I got the same result. The peppers are still very hot and i’m Cautious about giving them out if they don’t mellow in a couple of months. The spices are also all separating and congealing at the base of the jar which my aunt’s jar she gave me did not. Is there a common mistake I may have made to fix when I try this recipe again? Hi Emilee! Depending on the pepper you choose, the heat will vary. The Scoville score for jalapeños ranges from 2500-8000. There is a big difference between those numbers! How fresh the peppers are will affect the heat of the peppers. Growing season can play a huge role too. The hotter and drier the weather, the hotter the pepper. The only thing you could do to affect the heat of them is to remove the ribs and seeds. That is where a lot of the heat lives. There are only a few peppers that are not as hot as jalapeños, poblano, ancho and Anaheim. You could substitute one of those. As far as the sugars and spices dropping out of solution, (I had to go down to my pantry and look 🙂 ) they do drop out of solution. It doesn’t affect the flavor. They may mellow a bit with time, but not to any large extent. I hope that helps and thanks for your questions. Hi have you tried to add cucumbers slices to the peppers to make a sweet hot pickle? Wondering if this would wor? Thank you. I haven’t tried that Steve. I have done sliced sweet pickles with some of the same spices in the brine. I would give it a try! How bad could they be?? Thanks for your comment! Put them up in a 1/2 pint jar with a nice bow on top and they are great gifts!! I find they are better if they age a bit. Thanks, Jack! I appreciate your comment! Have a great weekend! I have four 2quart jars of jalapeños I bought at the store already sliced. They are in a clear liquid. Can I use these jalapeños? No, the clear liquid they are in is a pickling liquid, as well. Probably just not candied, unless it is labeled as such. It is best to use fresh, raw peppers! Thanks for the question Gwenda! Happy New Year!